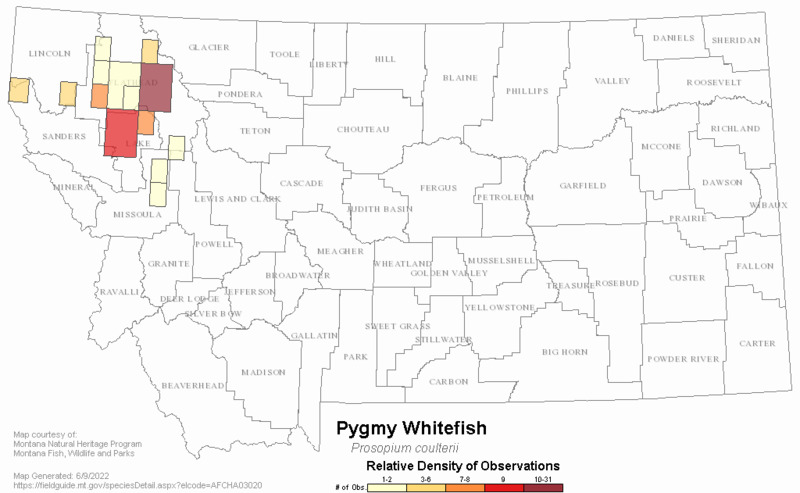 The Pygmy Whitefish is currently listed as an "S3" species of concern in Montana because they are potentially at risk because of limited and/or declining numbers, range and/or habitat, even though it may be abundant in some areas. Comment1,000 to 5,000 square kilometers based on literature records and recent records in MFISH. 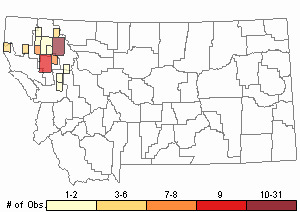 CommentSpecies requires focal sampling with small mesh nets at great depths and this sampling has not been consistently performed across the species known and/or possible range in Montana. CommentData from Hungry Horse Reservoir, Flathead Lake, and Swan Lake in the MFISH database doesn't appear to show any clear trends in numbers of fish caught per net set. Comment20-60% of cold rivers and deepwater lakes have introduced predatory fishes. CommentTypically found in relatively deep oligotrophic or mesotrophic lakes and in cold streams and rivers. Spawn on relatively diverse substrates and have a diverse diet. Pygmy Whitefish are a native salmonid in northwestern Montana. They seldom exceed 15.2 to 20.3 cm (6 to 8 in.) in length. Their overall appearance is silvery or white, except for an olive-brown back. The snout overhangs the mouth, the jaw lacks visible teeth, there is a single flap between the nostrils on each side, the eye is large (about the same diameter as the snout length), the transparent membrane surrounding the eye has a distinct notch below the rear edge of the pupil. The body is round in cross-section, the scales relatively large, with 54 to 79 along the lateral line, 31 to 40 around the body, and 16 to 20 around the caudal peduncle (Brown 1971, Page and Burr 1991, Holton and Johnson 1996). Distinguished from other whitefish by its small size as an adult, its larger eye, the notch in the membrane surrounding the eye below the rear edge of the pupil, larger scales (fewer than 70 along the lateral line), a single flap between the nostrils on each side. Pygmy Whitefish range throughout the headwaters of the Columbia River system in Washington, northern Idaho and Montana, and the coastal drainages north to south-central Alaska (Yukon River system), and the Chignik, Naknek, and Wood river drainages of southwestern Alaska. They also occur east of the Rocky Mountains in Lake Superior (Brown 1971, Page and Burr 1991). Migrates short distances. In late November and December large numbers move from the deep water of Flathead Lake and congregate at the mouths of the Swan and Flathead rivers before they enter the river systems to spawn (Weisel et al. 1973); similar movements and congregations have been documented at the mouths of Ross and Stanley creeks at Bull Lake (Weisel and Dillon 1954). Occupies deep cold-water lakes and their associated tributaries. Classified as adfluvial, hypolimnetic, and lacustrine for the Flathead Lake system (Ellis et al. 2011). Spawning occurs in tributary streams; all stream locations where the species has been found are associated with lakes. 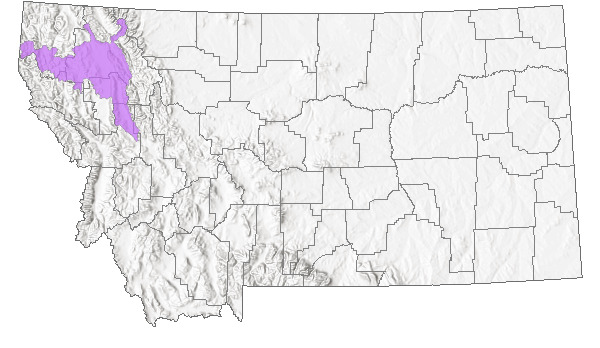 In Montana, Pygmy Whitefish have been collected in lakes or their tributary streams including McDonald Lake in Glacier National Park, Bull Lake, Flathead Lake, Ashley Lake, Little Bitterroot Lake, Seeley Lake, and Swan Lake (Brown 1971, Weisel 1954, Weisel et al. 1973). The amount of detritus and sand in Montana stomach samples during May to December is evidence that this species feeds at or near the bottom. Diet of Pygmy Whitefish includes aquatic invertebrates and fish eggs. Percent frequency of occurrence in 41 stomachs with food during December from Ross Creek (Lincoln County) included 8% Cladocera, 38% chironomid larvae, 3% Ephemeroptera, 8% unknown insects, 75% fish eggs, 33% detritus and sand; average frequency of occurrence from 278 stomachs with food during May to Novenber from Flathead Lake included 35% Cladocera, 47% chironomid larvae and pupae, 3% Trichoptera, 2% unknown insects, 1% fish eggs, and 12% detritus and sand. Percentages fluctuated across months, fish eggs appeared in the diet at both sites only in November and December, suggesting fish eggs are consumed only during spawning. A December collection of spawning whitefish from Ross Creek showed that fish eggs from other Pygmy Whitefish were the most frequently ingested food (Weisel et al. 1973). Young Pygmy Whitefish feed mainly on plankton (Brown 1971). Pygmy Whitefish comprised 0.0% of floating or sinking gill net samples in Flathead Lake between 1915 and 2005, but are considered common there nevertheless (Ellis et al. 2011). They are preyed upon by trout and other game fish; in Flathead Lake they frequently fall victim to smaller size classes of Lake Trout. The species is short-lived; in Montana few male Pygmy Whitefish live beyond their third growing year whereas some females reach their fifth growing year. Males attained lengths of 10.4 to 15 cm (4.1 to 5.9 in.) in a sample of 61 age II and III individuals from Flathead Lake; females of the same age classes (n = 70) tended to be larger, 10.9 to 16.0 cm (4.3 to 6.3 in. ), and age IV females reached 17.0 cm (6.7 in.). Growth of Montana Pygmy Whitefish from Flathead Lake and Bull Lake tends to be more rapid than from other lake systems throughout the range (Weisel et al. 1973). Spawning season of Pygmy Whitefish in Montana is during December and January. Males collected during spawning runs at the inlet of Bull Lake (Lincoln County) included 50% age I (second growing season), 47% age II, 3% age III; for a small sample of females, 64% were age II, 36% age III. The smallest ripe male was 8.6 cm (3.4 in.) standard length, the smallest female was 12.0 cm (4.7 in.). Males outnumber females at pre-spawning concentrations (November and December) at the mouths of the Swan and Flathead rivers by 6.7:1; 74.5% of age I males were mature, all age II and older were mature, while 27.8% of age I females, 90.2% of age II, and 100% of older females were mature. Females spawn in consecutive years; mature ripe eggs were present in the abdominal cavity while smaller eggs (1.0 mm diameter) were developing in the ovaries of ages II and III females. Egg counts of 28 females from Flathead lake ranged from 156 to 918 (mean = 588); the four largest females from Bull Lake had from 1027 to 1136 eggs (Weisel et al. 1973). 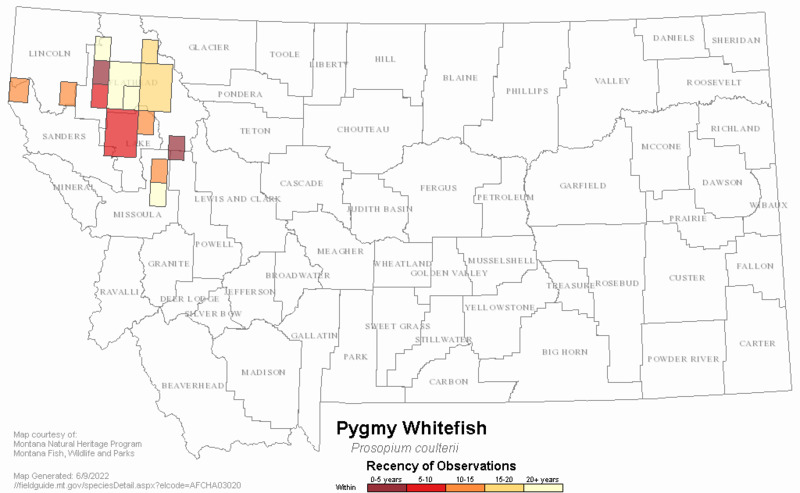 No management activities specific to Pygmy Whitefish are currently occuring in Montana. Pygmy Whitefish form a significant amount of the annual diet of smaller size classes (20.1 to 37.5 cm and 37.6 to 50.0 cm) of Lake Trout in Flathead Lake in all seasons except winter; population consumption of Pygmy Whitefish each season by these two size classes of Lake Trout was about 15,000 to 40,000 kg during 1998 to 2001 (Ellis et al. 2011). Surveys to determine the distribution and status of Pygmy Whitefish in Montana lakes would be useful. No significant threats have been identified. Predation by non-native fish, and protection of water quality, could be issues for some populations. Ellis B.K., J.A.Stanford, D. Goodman, C.P. Stafford, D.L. Gustafson, D.A. Beauchamp, D.W. Chess, J.A. Craft, M.A. Deleray, and B.S. Hansen. 2011. Long-term effects of a trophic cascade in a large lake ecosystem. Proceedings of the National Academy of Sciences of the United States of America 108 (3): 1070-5. Weisel, G. F. and J. B. Dillon. 1954. Observations on the pygmy whitefish, Prosopium coulteri, from Bull Lake, Montana. Copeia (2): 124-127. Weisel, G. F., D. A. Hanzel, and R. L. Newell. 1973. The pygmy whitefish, Prosopium coulteri, in western Montana. U. S. Fish Wildlife Service Fisheries Bulletin 71(2):587-596. Web Search Engines for Articles on "Pygmy Whitefish"